Without place or date [1847?]. On reverse of title leaf of the first volume of the German edition of his 'Gesammelte Werke', published in Leipzig, 'Verlag von Carl B. Lorck', 1847. 12mo, 1p. On the reverse of the title leaf, extracted from the 1847 Leipzig edition of his collected works. In fair condition, on lightly aged and creased paper. Note: an intern at the Danish Embassy in London tried to find someone in the Embassy to translate but it defeated them ("Gothic" or "German" so-called). A king reader has translated: den ædle Guldberg / Digteren / den første, som rakte den / fattige dreng Haanden, / bringes dette mit Livs Eventyr, / med Taknemlighed og Venskab / H. C.
[Lady Margaret Sackville, poet and children's author, mistress of Ramsay MacDonald.] Typescript of juvenile novel 'Sylvia Thistledown', with autograph emendations, regarding the advetures in Fairy-land of Amelia Egerton and the fairy of the title. On front cover: 'Margaret Sackville | 22. Lansdowne Terrace | Cheltenham'. Undated, but date stamped 30 November 1945. According to the Daily Telegraph, 2 November 2006 (see the end of this description), Lady Margaret Sackville was 'a poet who mixed with writers such as W B Yeats and Wilfred Scawen Blunt, was a friend of Lady Ottoline Morrell, a leading member of the Bloomsbury Set'. 167pp., 4to. Each page on the recto of a separate leaf, the whole bound with green thread through punch holes in margins. The first page worn and with label (of literary agent?) removed from head, otherwise in good condition, lightly aged and worn. [First volume in series 'George Cruikshank's Fairy Library'.] Hop-o' my-Thumb and the Seven-League Boots. Edited and illustrated with six etchings by George Cruikshank. 8vo, [ii] + 30 pp. All nine illustrations on six plates present as called for in list on verso of fly-leaf. 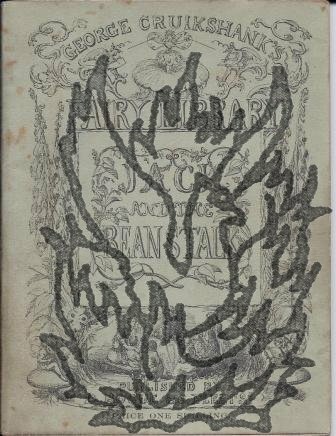 In original green card wraps, ornately illustrated on cover, which has at its head, 'GEORGE CRUIKSHANK'S | FAIRY LIBRARY'; and at its foot, 'PUBLISHED BY | D BOGUE 86 FLEET St. | PRICE ONE SHILLING'. On back cover: 'Preparing for Publication, | JACK AND THE BEAN-STALK. | EDITED | AND | ILLUSTRATED | BY | GEORGE CRUIKSHANK.' Internally good, on aged paper (the last print particularly foxed), in fair binding with light wear and slight staining. 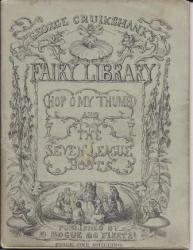 [Second volume in series 'George Cruikshank's Fairy Library'.] The History of Jack & the Bean-Stalk | Edited and illustrated with six etchings by George Cruikshank. 8vo, 32 pp. All eight illustrations on six plates present as called for in list on verso of fly-leaf. 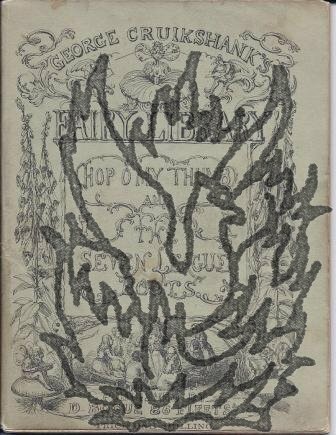 In original green card wraps, ornately illustrated on cover, which has at its head, 'GEORGE CRUIKSHANK'S | FAIRY LIBRARY'; and at its foot, 'PUBLISHED BY | D BOGUE 86 FLEET St. | PRICE ONE SHILLING'. On back cover: 'ALREADY PUBLISHED, | HOP O'MY THUMB AND THE SEVEN LEAGUE BOOTS, | ILLUSTRATED WITH SIX PLATES, CONTAINING NINE SUBJECTS, | BEING | No. 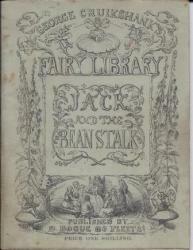 1 OF GEORGE CRUIKSHANK'S FAIRY LIBRARY. | Preparing for Publication, | No. III. | CINDERELLA AND THE GLASS SLIPPER. Autograph Note Signed ('A Lang') from the Scottish writer Andrew Lang to an unnamed male recipient. 25 January [no year]; St Andrews. 4to (leaf dimensions 20.5 x 16.5 cm): 63 pp. In original grey-green printed wraps. Tight and generally good, but with damp-staining to a few leaves, some wear to corners and creasing and grubbiness to the last three leaves. Wraps worn and grubby. Embossed bookseller's stamp to rear wrap: 'W. H. Smith & Son. 186 Strand, London.' Scarce: COPAC only lists copies at the Bodleian, the National Library of Scotland and the British Library (the last being attributed to 'MARSHALL, Charles, Traveller'). The beginning is reminiscent of Tolkien's 'Hobbit': 'POOR Glum-glum! Two Typed Letters Signed, with Typed Note, to ['Luckhurst',] the Secretary, The Royal Society of Arts. The two letters, 30 December 1938 and 12 June 1939; the note docketed 31 March 1938. All three items from 'Glenview', Harp Hill, Battledown, Cheltenham, Gloucestershire. Children's writer, poet and illustrator. All three items one page, quarto. All in good condition, with minimal staining. All three docketed, and the two letters signed 'Dorothy AH. Mills. F.R.S.A.' LETTER ONE: She enjoyed a 'magnificent' item by F. T. Blanchard in the Society's magazine 'immensely': 'it contained what it seems to me we have lost in England, in the appreciation of Letters, - namely, spirituality and idealism, and the Divine plan in the life of the individual.